Seconda fase dell’immenso progetto di riqualificazione energetica di casa nostra. Chi avesse voglia di leggere il riassunto delle puntate precedenti lo può trovare trovare qui. Alla fine mi sono deciso a mandare in pensione la “locomotiva” e l’ho sostituita con due moderne caldaie a condensazione che funzionano in cascata: la riduzione di potenza da 70 a 25+25 kW è un po’ un azzardo ma dopo aver studiato curve climatiche, schede tecniche e rendimenti, rifatti un milione di volte i calcoli, spero che non staremo al freddo, fenomeno che gli amici più cari sottolineano silenziosamente portandosi il golfino quando vengono a cena! Insomma, purtroppo nei 10.000 euro che avevo in mente non sono riuscito a restare e l’investimento finale sfiorerà i 30.000, anche perché le normative sono divenute nel frattempo – giustamente – molto più stringenti e la nuova centrale, pur con potenza complessiva ridotta da 100 a 75 kW richiede un florilegio di dispositivi di sicurezza certificati che prima non avevo ma che – ahimé – arrivano a costare un paio di migliaia di euro ciascuno. Le nuove caldaie vere e proprie con annessi e connessi mi saranno costate alla fine circa ventimila euro: da questo investimento (per due terzi detraibile dalle imposte) mi aspetto un risparmio annuale di circa 1.500 euro/anno di gas, il che vorrebbe dire rientrare in poco più di quattro anni. Dall’inverno prossimo si vedrà se questi calcoli sono stati esatti e se contemporaneamente è anche aumentato il comfort. Not that anybody cares, of course, but for personal reasons I find myself in the need of explaining how comes I have now such a deep animosity towards the industry where I earned my living (quite generously, I must admit) for about 20 years, that is Communications. We have become a culture that relies increasingly on the written word: the explosion of digital channels of communications has brought about countless improvements to the humane society, but it also the possibility of representations so detailed to be “almost as good” as the real thing. This is only going to get worse, with the maturing of technologies which have been in the “almost ready” limbo for decades, such as Augmented / Virtual Reality and Artificial Intelligence. We have two great examples right in front of us. in none of these languages, this term has a connotation other than 100% negative. But when you start calling them “fake news” for one thing you lose the substantive: how are you going to call a politician who spreads fake news? “Fakenewsman”? No, it’s so awkward that you simply stop using the substantive, with the result that the blame, the negativity moves from the liar to the lies, as if they had invented themselves, and the politician is merely guilty of not having checked more thoroughly. A few days ago, the Italian Statistics Institute reported that the GDP for Italy had dropped for the second consecutive quarter. Not a big drop, mind you, but enough to trigger the technical definition of a recession. No Government in the world likes for the economy it oversees to drop into recession, much less so when it bombastically predicted an economic boom days before, but there you go. Now the media are going to report on it mercilessly using the dreaded R-word, so what do you do? You steal the thunder, announcing it one day before it gets officially reported, but you use the term “technical recession”, apparently evoking the nature of the technical definition, but in reality to make it look less bad than it is. A technical recession is NOT a real recession, is it? Because if it was, why call it “technical” in the first place? If you execute right, these strategies work only too well, and in fact in both cases the media went for them hook, line and sinker: the word “lie” disappeared from global headlines and the adjective “technical” is now inseparable from the word “recession”. For now, the latter is in Italy only, but I am sure there are foreign economic journalists who are scratching their heads over what the difference between a technical and a real recession might be. It’s just that I have been in this game when it was relatively innocuous: I have called civilian casualties “collateral damages”; I have called deadly diseases “side effects”; I have called layoffs “restructurings”. I have witnessed the good power of communications (for example when the Italian Communist Party in talking about Red Brigades terrorists switched from “comrades who went too far” to “enemies of the people”) but I also have witnessed and practiced the evil power of Communications and simply decided this is not for me. A friend recently asked me for tips about a coast to coast trip he wants to undertake with his family. My memories sadly go back a little while (too much !) but I thought the best way was to share some of the learnings. In both cases we rented a motorhome in California, but while in the first we selected a commercial organization which offered one-way rentals, in the second we had to return the vehicle to California. I would stick to the first system, as you spend your whole vacation “traveling” instead of a good chunk of it “returning”. No motorhome is ever “too big” if you have to live in there with kids for three to four weeks. America is f*ing large: plan for 10,000 km itineraries and don’t overestimate your ability to drive long hours, it can be exhausting. I always tell the tale of the corn field where we camped in Wisconsin (I think): in the morning we took off and drove all day. Always. In. The. Same. Corn. Field ! America is a friendly place; whenever we stopped for a meal, say in the Nevada desert of along the boring highways in the Midwest, a Police patrol car stopped to ask if we needed help. Always very friendly and welcoming. Mind you, we almost always slept in proper campgrounds (there are PLENTY and cheap); it might be different for those who prefer camping just anywhere. You can’t take a 40-foot motorhome in a city: Los Angeles is a problem, New York next to impossible, Seattle a nightmare. We had trouble driving up to a friends house, in the outskirts of Eugene, OR. It’s just not worth it: rent a car and leave the beast in the rental office parking lot, will save you a lot of hassle and time. West beats East and they both beat Center, just as simple as that. Don’t ever forget that at some point you have to drive through 4,500 kms of feckin’ nothing; we crossed into Canada on the Great Lakes where at least the scenery is better than Michigan or Minnesota but, honestly, not much less boring. Halfway through British Columbia don’t take paved roads for granted, about half of the “highways” are not; that said, they’re usually well kept. Above Seattle, buy a copy of “the Milepost“, best 25 bucks you can spend (I still have mine); the Milepost is what guidebooks become when they grow up. Alaska is feckin’ big (as in “two-and-a-half-times the size of Texas” big); they say there’s mosquitoes, but we didn’t find any; you may want to make sure you arrive there in July, summer’s pretty short there. The scenery is jaw-dropping, though. We went salmon fishing (bitter cold), flew to a deserted beach but only scratched the chin of this big State: it’s anothe 1,000 kms and back to Fairbanks. If you were thinking Alaska, I’d fly to Fairbanks, buy a second-hand truck there, sleep in lodges, drive around then sell it back in Vancouver or Seattle. Nel terzo secolo la popolazione di Silena, in Libia, era angariata da un drago che ammazzava con la sua fiatella; per placarlo gli abitanti lo nutrivano con due pecore al giorno, ma quando gli ovini cominciarono a scarseggiare, li sostituirono con giovani tirati a sorte, finché non toccò alla figlia del Re, salvata solo dal provvidenziale intervento del cavaliere Giorgio, un turco cristiano (ahem!) che, riparato dietro lo scudo crociato (ahem!) ne fece carne di porco in men che non si dica. 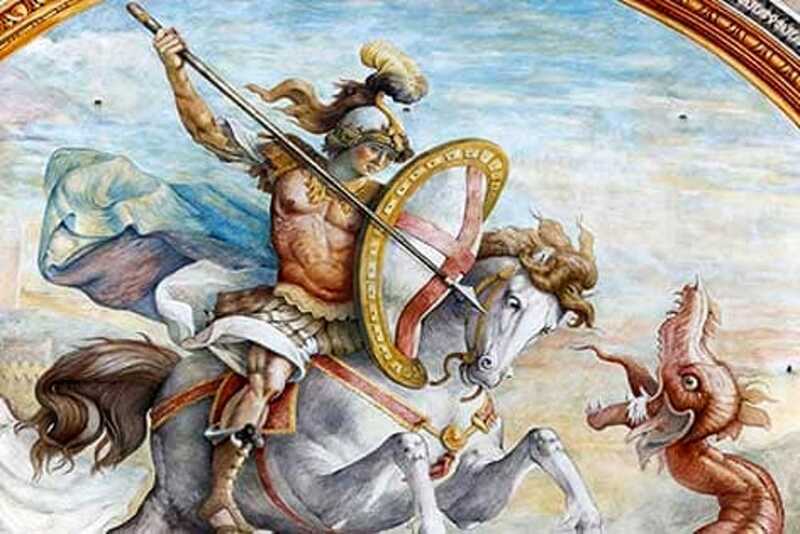 Se non ci fosse stato il drago, Giorgio non sarebbe stato che un soldataccio di passaggio, ed infatti in seguito divenne guardia del corpo dell’imperatore Diocleziano che per tutta gratitudine lo mise a morte in quanto cristiano facendone un Santo. I nostri governanti sono come Giorgio: incapaci di costruire o gestire (ruoli che richiedono perizia e competenze) girano in cerca di draghi da ammazzare: negri, euroburocrati, magistrati, studenti. Va bene tutto, purché sputi fuoco. Ad ogni voce che si leva criticando rispondono automaticamente con la stessa battuta “Si faccia eleggere”: è toccato a Tito Boeri ed oggi tocca ad Armando Spataro, una serie infinita di duelli per decidere chi è più veloce. Nemmeno concepiscono che ci sia chi non ambisce ad essere eletto ma mantiene la capacità di criticare ciò che gli pare sbagliato. E oggi, dopo che si è divorato i pentecatti un boccone dopo l’altro, sappiamo che nessuna pistola si può misurare con Salvini. O forse è al maschile? IBM Domino v10 is being released. That’s a long way from the original Lotus Notes, itself the grand-nephew of Iris Associates’ Notes. When Lotus bought IA, I was their Country Manager for Italy. We (like all the PC industry) were selling spreadsheets and word processors at the time, simple stuff which did well one simple thing on a single PC. Well, Notes was not like that at all, and despite trainings and brochures, most of us could NOT effectively explain what Notes did and therefore why customers should buy it. So I did the only sensible thing for an ex-nerd: ripped open a box and installed the damn thing on my machine and (without reading a single line of the manual) started playing with it. Within a week or two I had familiarized myself with the programming language of Notes and developed what quickly became the most used Notes application in Italy: JOKES.NSF where people would write silly jokes and others could comment. The Jokes database was by default included as a sort of general demo on every installation of Lotus Notes in Italy, and was used by so many Sysadmins that our own systems engineers posted there tech messages because it was the best way to make sure they would be read quickly. There might a few people among my contacts who remember Jokes.nsf and if you are an early adopter of Lotus Notes a copy of this social network ante-litteram could lay dormant on your servers, waiting to amuse you. Therefore I salute Domino 10: this is my small tribute to one of the best pieces of software I ever came across. For the best part of the last two years, I devoted my life to this start-up, OneWedge. Like any start-up, it has been so far an exhilarating journey: since its inception, we (me and my brother Paolo) have been working on defining the business model and testing it with hundreds of potential customer calls. We’ve been encouraged by the fact that so many big corporations took the time to discuss our idea with us, even though we are nothing, yet: we have been met with genuine interest which sometimes resulted in rejection, more often in polite, “let’s-keep-in-touch” interest and in some cases in authentic, enthusiastic support. However our idea needs money (several millions) and the search for funding has been exactly like they tell you it is: endless pitching of investors, looking for the right one. That part is not pleasant, take my word, rejection is ugly. If this is the solution, how comes no-one of your many, big competitors has thought of it? It’s the worse kind of objection, first of all, because it’s implicit, secondly because I have been asking myself the same question every morning for the past two years. Reading books written by entrepreneurs who made it, usually you find an empirical 10-to-1 rejection rate, meaning 9 out of 10 investors you pitch won’t even meet you, and 9 out of 10 you meet won’t invest. By that metric, I am still way short on rejections. Anyway, next Monday we’re headed for Florence where we’ll meet a group of hot investors prospects; this is not really a cold call, as we had the benefit of a long preparation phase with investment advisors: this meeting has been thoroughly prepped and their interest probed already. The deck has been scrupulously rehearsed – including the de-luxe rehearsal session at the TEDx – and it has been a long time since I have ever met a “new” objection. I write this ahead of the event to make sure I faithfully record my feelings as they truly are and not through the filter of delusion or elation depending on the outcome. I need my best performance, ever – I play the visionary, Paolo plays the concrete, down-to-earth Operations man. By experience, I know the impact will be directly proportional to how high on adrenaline I will be, because audiences large or small feel energy flowing and are attracted to it, they want to partake. Most people think that events like the TED limit the length of talks to less than 20 minutes not to bore the audience, but I think the real reason is that they don’t want to exhaust the best speakers who pour immense amounts of energy on the audience. Thanks God the week is almost over, only 80 hours to go, then we’ll look down the trampoline. After that, there is only the jump. Due giorni intensi, uno schizzo di adrenalina fino al cielo seguito da un down di molte ore.
Arriverà l’iconografia ufficiale ma nel frattempo ecco qualche immagine e, in serata, il video con la Mobilità Elettrica in meno di 18 minuti. Troppo comodo limitarsi ad indicare il problema, senza proporre una soluzione! il quesito diventa: come facciamo a ridare speranza agli Esclusi, convincendoli che sulla base dei propri meriti hanno anche loro la possibilità di rientrare tra le Élites? Come facciamo a prendere da chi ha per dare a chi non ha, evitando il rischio del banale assistenzialismo che caratterizzava le distribuzioni di frumento dell’Antica Roma spingendola alla sua espansione militare senza limiti? Insomma, l’obiettivo è far sì che la redistribuzione “attecchisca” mettendo in moto l’ascensore sociale: riflettiamo dunque su quali azioni siano possibili in ciascuno dei tre stadi dell’ascensore. La storia ci dice che tassare i Patrimoni è sempre più difficile: se una volta i patrimoni si toccavano (case, ville, palazzi, terreni) oggi essi sono sempre meno “real estate” e sempre più virtuali. In effetti non credo esista da nessuna parte un registro di chi ha, quanto ha e soprattuto dove ha. Dunque il primo problema sarebbe dove andare a prendere le informazioni; certo, si può immaginare di obbligare le banche a operare un prelievo forzoso nottetempo dai conti correnti, una strada già testata con risultati disastrosi. Anche a voler ignorare gli eventuali profili di incostituzionalità, una misura di questo tipo dovrebbe comunque essere legiferata e quand’anche l’urgenza del momento permettesse di ottenere una maggioranza, nell’istante stesso in cui si iniziasse a parlarne i grandi patrimoni in pochi microsecondi sarebbero trasferiti verso lidi sicuri, ma soprattuto le Banche sarebbero prese d’assalto facendole fallire tutte in pochissimi giorni. Per mitigare un effetto del genere, bisognerebbe che non vi fossero “lidi sicuri”, cioè che questa stessa legislazione restrittiva venisse posta in essere in tutte le economie sviluppate o, almeno, a livello Europeo. Lo stiamo facendo dalla fine del Settecento(1) ed in effetti gli economisti hanno rilevato qualche beneficio: tra il 1950 ed il 1980 le disuguaglianze si sono effettivamente ridotte. Questa tassazione però si è lasciata “scappare” i redditi di tipo finanziario, che dal 1980 in poi hano ricominciato a far crescere il divario tra Élites ed Esclusi. In più sempre maggiore vigore assumono le teorie di fiscalità piatta, nonostante l’evidenza del beneficio spropositatamente concentrato su chi ne ha meno bisogno, grazie alla retorica della trickle down economy che non è suffragata dai fatti ma sembra tangibile e diretta e dunque, piace quasi a tutti. La correlazione positiva molto forte tra qualifiche superiori e reddito viene provata di continuo, ed è del tutto evidente che un ingegnere con un ottimo stipendio rende allo Stato molto di più di un commesso di grande magazzino pur costandogli sostanzialmente lo stesso (sanità, infrastrutture, difesa). Se rende di più, allora, perché non investire per incoraggiare il giovanotto diciottenne a scegliere l’una via anziché l’altra? tutte graduabili in funzione dei risultati ottenuti: uno studente volenteroso e capace ottiene tutto gratis, e anzi viene mantenuto agli studi, mentre un somaro svogliato – se proprio vuole studiare – si paga tutto (come succede ora). Certo, poi ne discenderebbe la necessitò di un miglioramento della qualità delle Università italiane e, di conseguenza, degli altri ordini di studi anche se sono persuaso che non stiamo partendo da una situazione di drammatico ritardo. La ragione forse è che le ideologie non descrivono più adeguatamente i blocchi sociali. Piketty ha ben descritto la spirale di accumulo che inesorabilmente concentra nel 10% più ricco della popolazione una percentuale spropositata dei guadagni: l’imposta progressiva sul reddito ha rallentato il fenomeno ma non lo ha fermato, creando con l’andar del tempo accumuli incredibili di ricchezza. Fa tristezza pensare con quanto abbandono ora si promuove la tassazione piatta che darebbe un ulteriore impulso a questo tremendo meccanismo sperequativo. Quelli che FANNO (i soldi) piano piano si trasformano perciò in quelli che HANNO (i patrimoni) ed, una volta lì giunti, sfuggono in buona sostanza alla livella delle tasse. La soluzione del capitalismo moderno è stata quella di dare ad ognuno la possibilità di essere tra quelli che FANNO regalando a tutti salute ed istruzione gratuite (o quasi): quelli che SANNO possono perciò diventare quelli che FANNO e, se sono fortunati, anche quelli che HANNO. Ma mentre questo ascensore sociale faticosamente faceva il suo lavoro, il motore del capitalismo metteva il turbo al settore finanziario grazie a innovazione tecnologica e globalizzazione ed il divario, anziché diminuire, è aumentato facendo aumentare anche il livello delle competenze necessario per mettere in moto l’ascensore stesso, tagliando così fuori fasce sempre maggiori di popolazione. La frattura fra l’élite di chi SA, FA e perciò HA e il popolo che ne è escluso si è definitivente consumata. Non deve dunque meravigliare se il popolo escluso ascolta sirene populiste: anche solo per comprendere l’illogicità di certe promesse bisognerebbe SAPERE, ma il popolo è per definizione escluso dal sapere che, anzi, guarda con sospetto perché lo percepisce (non senza ragione) quale primo strumento della propria esclusione. Senza nessun complotto si è formato il partito dell’Élite (i pochi che SANNO, FANNO ed HANNO e il partito del Popolo (i molti esclusi) come innumerevoli volte prima d’ora e se in passato questa tensione ha scatenato sanguinose rivoluzioni, oggi basta votare: Ungheria, USA, Russia, Austria, (quasi) Francia, (quasi) Olanda, Italia e chissà quanti altri. La Storia insegna però che queste Rivoluzioni – nascano nel sangue o nelle urne – alla fine cambiano molto poco: al più (ma nemmeno sempre) cambia qualche nome nella Élite ma… tutto ricomincia come prima. trovare il modo di rallentare i meccanismi divergenti di accumulo. Archiviata con grande soddisfazione l’edizione 2018 del nostro barbecue d beneficenza. abbiamo consumato 115 salamelle, 18 kg di pulled pork, 6 kg di fagioli, 12 kg di peperoni, 14 melanzane, 25 kg di patate, 16 filoni di pane, 130 panini, 60 birre, 26 bottiglie di vino, 56 litri d’acqua, 140 porzioni di dolce, quasi 1,5 kg di ciliegie, 2 torte portate dagli ospiti e… 94 caffé ! Tre portate di carne sono troppe, meglio fermarsi a due (sono rimasti nel surgelatore una quindicina di kg tra costine e hamburger) EDIT: i buoni frati si sono presi tutto ciò che era avanzato, e ci hanno doppiamente ringraziato!